While he is not as hyped as other 2015 rookies, Randal Grichuk is already establishing his legacy with the St. Louis Cardinals. An elbow injury during his rookie season hurt his chances as a dark-horse Rookie of the Year candidate, but collectors have not missed out on the young slugger. 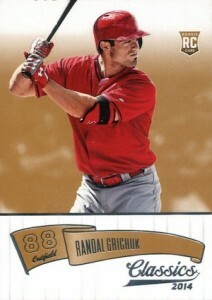 Check out the key rookie and prospect cards for Randal Grichuk below. Randal Grichuk originally planned to play college baseball for University of Arizona. However, things quickly changed when he was selected 24th overall in the first round of the 2009 MLB Draft by the Los Angeles Angels. After choosing the Angels over the Wildcats, several injuries slowed his progression in the minor leagues. Grichuk played his first full season in 2012 and seemed close to joining the major leagues in 2013 before a trade sent him to the St. Louis Cardinals. Although he made his MLB debut in 2014 with the Cardinals, he is still considered a rookie in the 2015 season. 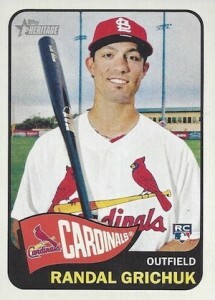 Due to his involvement in USA Baseball, the first Randal Grichuk cards were issued in 2008. 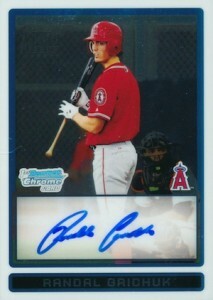 The normal prospect cards, including his first Bowman Chrome autograph, came in 2009. Because of his 2014 year with the Cardinals where he was called-up and sent back down to the minors several times, Grichuk's rookie cards were only included in some of the final 2014 products, greatly limiting the total number. So while he is officially a rookie in 2015, collectors have just a few choices in 2014 to find his rookie cards. The following guide includes his three official rookie cards and the key prospect options for Randal Grichuk. Sporting a very generic design, the 2014 Classics rookie is not an amazing option, but there is really not much to work with. 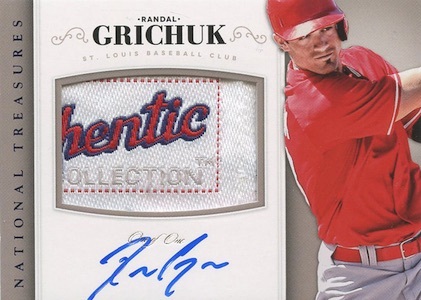 Grichuk also has signed cards in 2014 Classics with the RC logo. National Treasures does not carry the same brand power in baseball as it does in other sports, but the high-end product is still a viable option for Randal Grichuk collectors. While they curiously elected not to include the rookie card logo, the 2014 National Treasures card features a sizable swatch and on-card signature. The base version is numbered to 99 and the one-of-one tag parallel is shown below. As the only Randal Grichuk rookie card to showcase his full MLB gear, 2014 Topps Heritage High Number wins by default for many in the hobby. Part of a factory set, the base card is only worth a few dollars. To help avoid confusion with the main Heritage set, the card number features an "H" prefix. The Randal Grichuk prospect autograph card in 2009 Bowman Chrome Draft Picks & Prospects is the ultimate option for collectors. The strength of the Bowman Chrome name, combined with multiple Refractor parallels and an on-card signature, makes this the most popular Randal Grichuk card. 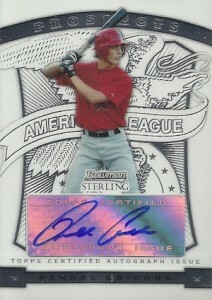 A cheaper option, but still one of his first signed cards as a pro, Bowman Sterling features a loud background design and foil sticker autograph for Randal Grichuk. While very plentiful, the 2009 Donruss Elite Extra Edition card for Randal Grichuk is still numbered, setting it apart from other early prospect cards. 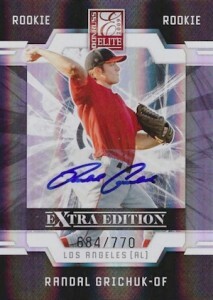 The airbrushed jersey image allows collectors to pick this signed card up for reasonable amounts.